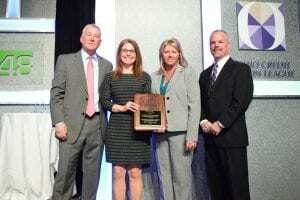 The Ohio Credit Unions for Kids (CU4Kids) Alliance was recently honored with the coveted Dora Maxwell Award. This award recognizes a credit union or chapter for its social responsibility projects within the community. The Ohio CU4Kids Alliance won for their annual Candy Bar Sales, which raised $24,480 for 7 local children’s hospitals! Dora Maxwell was an original signer of CUNA’s constitution and a tireless organizer of hundreds of credit unions throughout the United States. She also developed volunteer organizer clubs and worked diligently with organizations on behalf of the poor. The Maxwell Award is presented to credit unions for outstanding social responsibility projects in their communities. Activities may include: solving core community problems, coordinating supply drives for the needy, raising money or organizing special events for charitable organizations, or mentoring students. Credit Unions involved in the Ohio CU4Kids Alliance: Ohio HealthCare FCU, KEMBA Financial CU, CES CU, TopMark FCU, Lake County Educational FCU, AurGroup Financial CU, CSE FCU, State Highway Patrol FCU, Credit Union of Ohio, and Universal 1 CU. Children’s Hospitals that were benefited from the Alliance’s efforts: Nationwide Children’s Hospital, Mercy Children’s Hospital, Rainbow Babies & Children’s Hospital, West Virginia Children’s, Cincinnati Children’s, Dayton Children’s, Akron Children’s. The Ohio CU4Kids Alliance will be recognized for this award at the Governmental Affairs Conference (GAC) in March 2019. Next post: #VoteforMiracles Nov. 27 – Dec. 18 and KU Medical Center Pediatrics Could win $50k from Credit Unions for Kids!